The ninth Annual General Meeting of the Lower Mole Countryside Trust was on Thursday 8th March 2012 at the New Room, Horton Country Park. The meeting was followed by an interesting talk by Stewart Cocker, on the history of the Horton Light Railway. The are links to the agenda, minutes of the last AGM and the annual report below. The Living Woodlands fund has received a boost with several donations including £350 from Waitrose after the Trust’s appeal was featured as one of the green token charities in the Epsom branch and also £1000 from Toyota. In addition the Trust’s ‘Mountain Out of a Molehill’ appeal to members has raised over £300 so far. These donations will help to fund work at the ever expanding number of Living Woodlands sites. The arrival of two storage containers early in 2011 by our office at Horton Country Park has streamlined the Trust’s firewood sales and provided storage for timber milled from larger oaks felled as part of coppice management. The Project received just over £3,000 from Elmbridge Borough Council to pay for the containers and for the work to fit them out and paint them. In early September the Project organised forwarding of felled trees on Epsom Common to a central location, this was followed by milling the timber to supply the Projects needs for signposts and benches, so that this work is as sustainable and environmentally friendly as possible. During July the Project surfaced the access track into Watercut Copse as it was starting to become rutted with increased use due to the coppicing. This was jointly funded by the Trust and Elmbridge Borough Council. 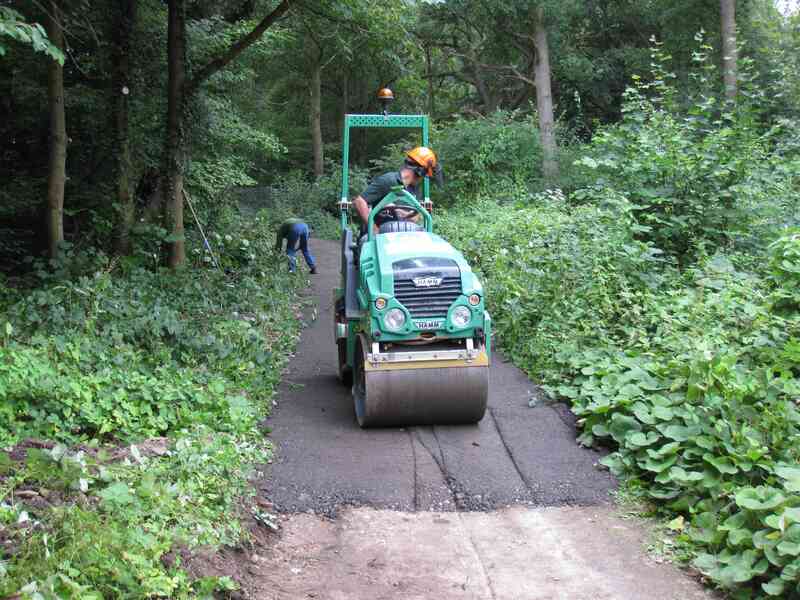 During September similar work was carried out at the Warren, with the access track into the wood being surfaced. This work was funded by a Forestry Commission grant and the landowners. At Sixty Acre Wood, where a coppice worker has been managing some of the woodland for the last few years, staff from Chessington World of Adventures have been carrying out regular reptile surveys over the summer. The Project has also worked at Moor Lane allotments, Moles Copse and Princes Coverts during the last six months. Over the autumn/winter period there has been a lot more activity on Living Woodlands sites, including at two new sites for this season – Nonsuch Park and Arbrook Common. The Project has received a grant from the Heritage Lottery Fund to fund a Living Woodlands Project Officer who will promote woodland management through educational events. The Trust funded a reprint of the Project’s publicity leaflet, which also mentions the Trust, in June 2011. The Trust has given a grant for the Bentley Community Support Service to purchase tools for their Team to carry out regular maintenance at Stones Road Pond SSSI in Epsom. Their work will help conserve the great crested newt population at this small site.